Last week Roush offered up a sneak peek of their 2013 Stage 3 Mustang with photos that revealed the rear of the car as well as the engine plaque that showed the new horsepower and torque figures. We even found some renderings of the car that gave us a good idea of what the finished product will look like. Now the slow reveal of the 2013 RS3 continues, this time with a look at some of the details of the front of the car. The new photos show off the new styling of the car including a hood scoop set in between the hood vents as well as the new high-flow upper grille with the a Stage 3 badge. Roush is also offering a look at what appears to be the optional competition brake package that includes 14-inch slotted rotors. There’s still no word on when Roush plans on completely unveiling the 2013 Stage 3 Mustang, but you can be sure that we’ll be the first to tell you when they do. Until then, check out the new photos in the gallery below. 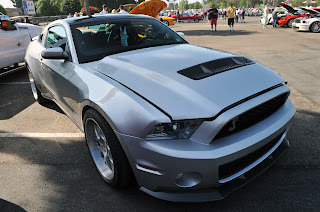 This entry was written by by MustangsDaily (Mustangs Daily) and posted here on Tuesday, March 20th, 2012 at 12:08 pm and is filed under 2013 roush rs3, 2013 roush stage 3 mustang, News, roush rs3, roush stage 3 mustang. This article was not written by us, rather gathered using RSS feeds listed here. We take no credit for this article. You can leave a response, or trackback from your own site.